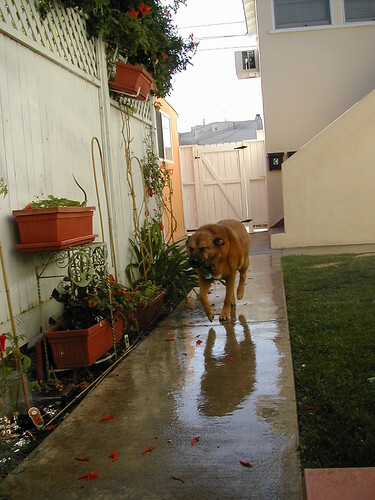 Could not let 08-08-08 pass by without posting something, so here’s a little LaLaLand garden update. The brinjal/aubergine/eggplant has borne some beautiful fruit, of which this is one (the plant in its infancy). There are a couple of wee ones tucked away behind it, and a weird bendy one somewhere in the dense vegetation. 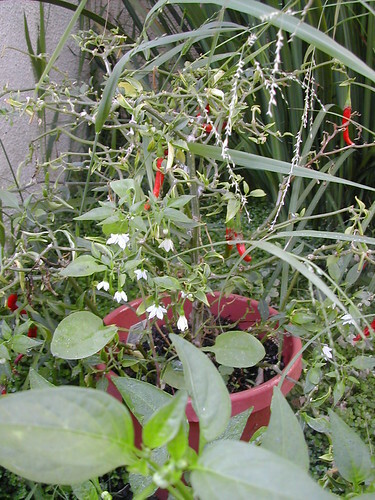 The Thai dragon chilli plant is still doing well and over-producing chilies. I think it’s time to give some away instead of just freezing them. Unfortunately, we had to stop eating Thai chillies because P has discovered they result in a really nasty reaction. Two basil plants (Genovese and sweet) are growing like mad. I’m afraid they’ll bolt and we’ll lose them again, just like last year. Strawberries are slowly producing small fruit. I suspect I’m not watering the pots enough. Herb-wise, I also now have some Italian parsley, English thyme and French thyme. 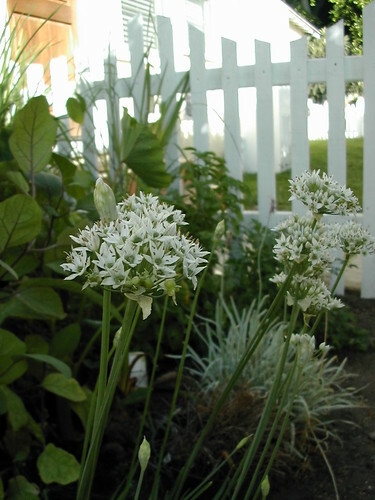 The garlic chives are going crazy, possibly recovering from the constant sprinkling my neighbour’s dog was giving it in spring. And tomatoes, oh my tomatoes! The roma plant that grew like crazy last year has peaked and died. The San Marenzo gave us a killer crop, which we had to perform an emergency harvest on. It is also now dying (must save with more nutrients). The cherry tomato plant cropped 2 cuties, one of which was gobbled by a passing bird (or something else). And there’s a new roma that’s doing ok, but also suffering from nutrient loss. In all, the LaLa garden is doing well despite my lack of attention. Here’s to more happy harvests! 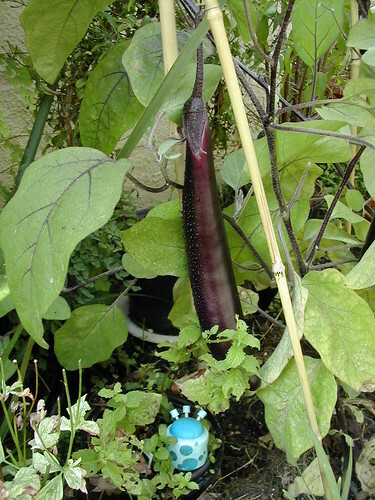 This entry was posted in akatsuki talkingrot and tagged aubergine, brinjal, chillies, chives, eggplant, gardening, my lalaland veggie patch. Bookmark the permalink.